Massive Bank Profits Are Surging Under Tax Reform, Net Interest Income, Higher Loan Balances - 24/7 Wall St. The banking industry has seen its profits surge under a strong economy and tax reform. The Federal Deposit Insurance Corporation (FDIC) has released its Quarterly Banking Profile for the second quarter of 2018, and it turns out that commercial banks and savings institutions insured by the FDIC had a total net income of $60.2 billion during the second quarter of 2018 alone. If this figure sounds massive, it should. That net income was up $12.1 billion, or a whopping 25.1%, from the second quarter of 2017. Multiple issues are driving the strength in bank profits. The FDIC cited higher net interest income on top of the lower effective tax rate, but also added were higher loan balances (up 4.2%) with noncurrent loans declining and net charge-off rates listed as stable. Industry watchers should take note that more than 70% of the 5,542 insured institutions reported year-over-year growth in their quarterly earnings. Also, worth noting is that the share of unprofitable banks fell to 3.8% in the second quarter from 4.3% a year earlier. Before thinking that it’s all glitter and gold here, note that the report included some warnings. The FDIC indicated that the competition to attract loan customers will be intense, and that banks are going to need to maintain their underwriting discipline and credit standards. That said, this has been shown to be record bank profits by CNN and 24/7 Wall St. showed two charts below showing pre-recession profits and post-recession profits. The growth also may be running higher at the larger banks than the community banks. Of the 5,542 insured institutions, some 5,111 are currently counted as community banks. This much larger group in numbers, but far smaller in size, saw their net income rise by about $1.1 billion from a year ago, or 21.1%, to $6.5 billion in the second quarter. The FDIC’s so-called Problem Bank List shows a decline to 82 banks (from 92) during the quarter. The Deposit Insurance Fund balance rose by $2.5 billion to $97.6 billion by the end of the second quarter. Net interest income rose by $10.7 billion (8.7%) to $134.1 billion in the second quarter. The average return on assets rose to 1.37% from 1.13% a year earlier. The average net interest margin rose to 3.38% from 3.22% a year earlier, as average asset yields increased faster than average funding costs. Net charge-offs increased by $446.4 million (4 percent) from a year earlier, led by a $918.9 million (12.8 percent) increase in net charge-offs for credit cards. The average net charge-off rate (0.48 percent) remained stable from a year ago. The banking industry experienced continued improvement in net interest income, noninterest income and loan performance this quarter. However, the interest-rate environment coupled with competitive lending conditions have led to heightened exposure to interest-rate, liquidity, and credit risks. The industry must continue to position itself to be resilient through economic cycles. 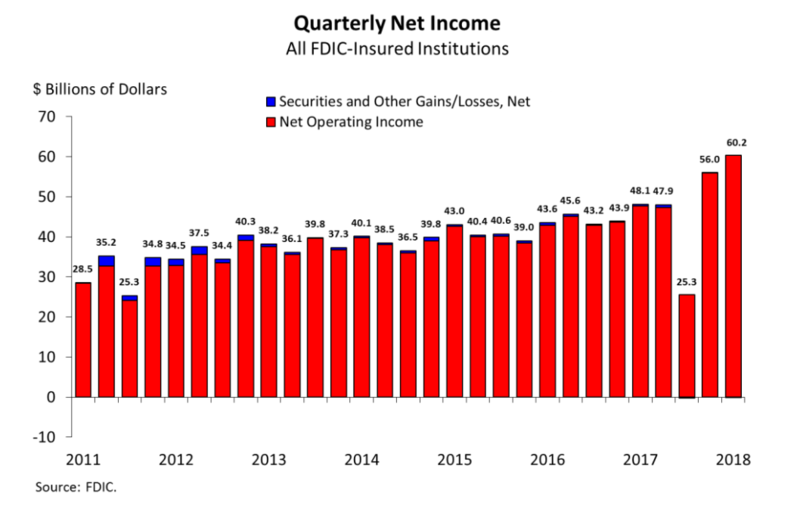 An FDIC bar chart has been included below that shows banking trends from 2011 through the second quarter of 2018. 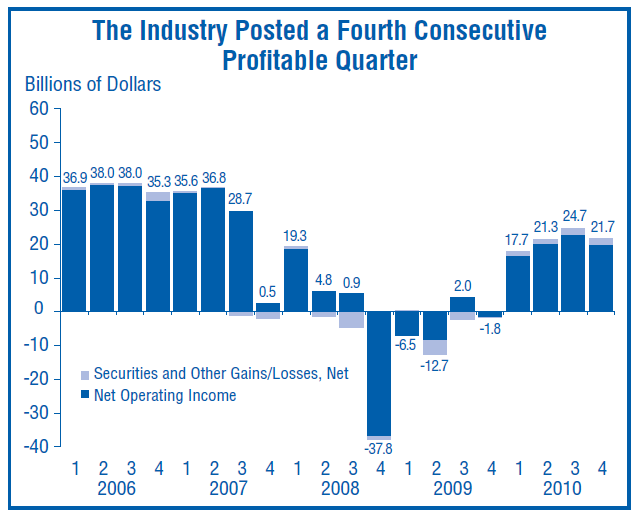 A second bar chart, from 2006 to 2010, shows how quarterly profits looked during and after the recession, back when there were 7,657 institutions under the FDIC.